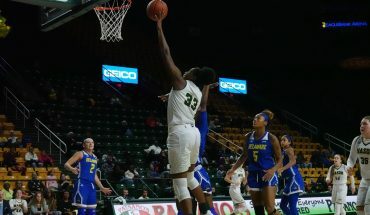 Some familiar faces will not be suiting up for George Mason’s Men’s Basketball team this year. Five players, DeAndre Abram, Danny Dixon, Kameron Murrell, Kamari Newman, and Troy Temara, transferred-out of the program this off-season. Transfers are the name of the game in college basketball, so there should be no worry for George Mason fans. In particular, transfers during the first handful of seasons with a new head coach happen all the time. None of these players were starters, nor were they in a position to take a starting spot this season or next. The one who had the best chance to become a starter would be Temara, but he would be battling Daniel Relvao and freshman Greg Calixte for time down low in the paint. After his performance last season, there is no guarantee that he would have earned that spot. Of the transfers, the highest minutes on the court was Newman, averaging 15 minutes a game off of the bench. Newman has to come as the biggest shock and the biggest loss of this group. Off the bench, he had 4.7 points a game and was 33 percent shooting from behind the arc. However, like the others he was down the line on the guard depth chart, and quite frankly, he could easily be the starter at another school. Already each player has found a new home. Abram and Newman will see action against each other in the Horizon League for a couple seasons as they committed to the University of Wisconsin-Milwaukee and Oakland respectively. Murrell will move down to Division II at St. Thomas Aquinas, Dixon moves to UMKC, and Temara will play with the junior college Palm Beach State this year. Again, this is not a sign of bad things for the men’s basketball program. More so that head coach Dave Paulsen keeps bringing in top recruits and there is not enough playing time to go around.